Our silver jewelry is created by our own artisans and are original designs with intricate detail.Our Silver Jewelry is hand-finished by americans as our Jewelry is 100% made in the USA. We guarantee our Silver with the highest standard , in the most affordable price you can find for this quality. 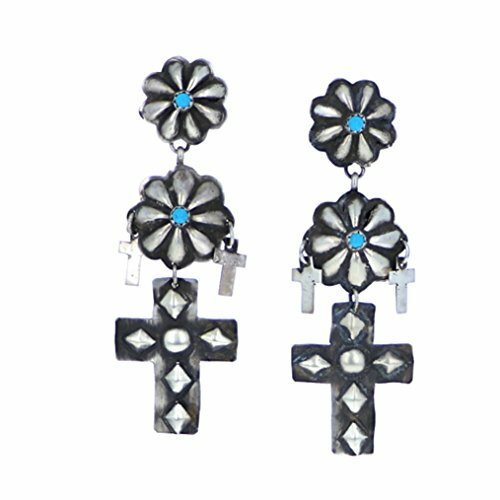 Sleeping Beauty Cross Earrings, Length: 2 3/4", Width: 1"
If you have any questions about this product by Navajo Artistian Jewelry, contact us by completing and submitting the form below. If you are looking for a specif part number, please include it with your message.